As May 9, 2016, approaches, are you still unsure about the stands of Senators Alan Peter Cayetano, Chiz Escudero, Gringo Honasan, Bongbong Marcos and Sonny Trillanes, as well as Camarines Sur Rep. Leni Robredo? 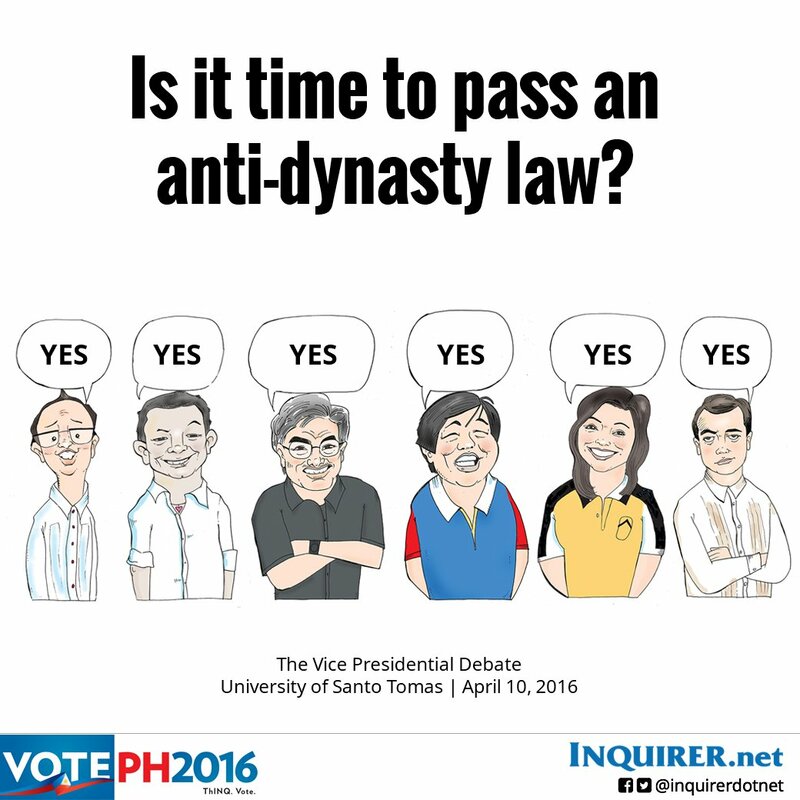 INQUIRER.net had the six vice presidential candidates directly answer a 25-statement questionnaire, asking their stances on key issues that have not fully been explored in the lone vice presidential debate. Their answers, all listed below, may surprise you. 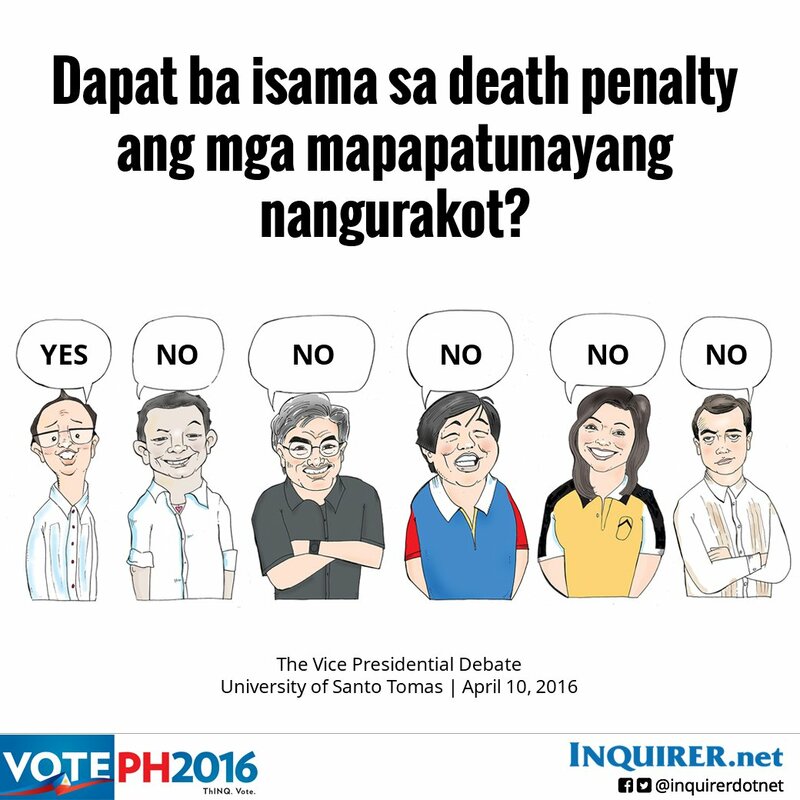 Before reading the summary of the vice presidential candidates’ responses, we encourage you to take our #INQuiz first! The Conditional Cash Transfer program of the Aquino administration should be continued–in its present form–by the next administration. But with expansion to include cash-for-work, cash-for-building, etc. Opening land ownership to foreigners for commercial and industrial purposes will boost the country’s business climate, as it will attract more direct foreign investments and thus create more jobs. In December 2015, the Supreme Court ruled to stop the field testing of Bt eggplant and the testing, propagation, commercialization and importation of genetically engineered crops. The decision is a blow to scientific research and the country’s efforts to attain food security. The “no parking space, no car purchase” policy should be adopted in Metro Manila and other highly urbanized cities. The next administration should continue with the PPP (public-private partnership) program as applied to public hospitals. PPP on public hospitals should be reviewed to protect indigent patients. The death penalty should be reinstated for heinous crimes. But only for drug lords. While diplomacy and international arbitration remain the most desired approach to resolving territorial disputes in the West Philippine Sea, the country’s mutual defense treaty with the United States should increasingly come into play in the face of China’s continuing military buildup. The bank secrecy law should be amended to remove the protection of public officials under investigation for corruption. At the opening of a coal-fired power plant in Mindanao in January 2016, President Aquino was correct in saying that the country cannot wean itself completely from relying on coal because of uncertainties regarding wind strength, solar efficiency and biomass supply. The next administration should ensure the entry of new competitors in the country’s telecommunications industry to bring down rates and improve Internet services. The government has sufficiently prepared for the K-to-12 program in terms of teachers’ training and salaries, and availability of teachers, teaching material as well as classrooms. Other countries subsidize creative industries like the performing and visual arts, film, etc. Philippine talent, arts and culture should be developed and promoted, funded, given incentives, and legislation should be enacted toward this end. An efficient and well-funded system is necessary to search for promising youngsters in the grassroots for training in sports such as track and field, swimming, boxing, etc, and distinctively Filipino disciplines like arnis. The continuing raids on prison cell blocks and “kubols” should be stopped. The Philippines is a laughing stock of the world because of the proliferation of political dynasties nationwide, and it’s time for the constitutional ban to be followed through an enabling law. The remains of former president Ferdinand Marcos should be buried at the Libingan ng mga Bayani. Former President Gloria Macapagal Arroyo should be transferred from hospital arrest to house arrest. The gains of labor export (remittances that help keep the economy afloat) pale beside the social problems that it has produced (broken families, a generation of children lacking parental love and guidance, abuse of OFWs in countries of employment). Donald Trump as the next president of the United States will be a boon for the world. The coconut levy funds represent large-scale robbery of coconut farmers and should immediately be used for their and the industry’s benefit, and the perpetrators of the robbery identified and punished. The legalization of divorce is long overdue in the Philippines and will contribute to the betterment of society. The Philippines has the highest income tax in the region and should be lowered. The population is growing by leaps and bounds and should be curbed through proper implementation of the Reproductive Health Law. Antidiscrimination laws are sorely needed to protect LGBTs. The construction of coal-powered plants should be banned as an urgent step to stop global warming.